You loved it in 2011, and it’s back for 2013! 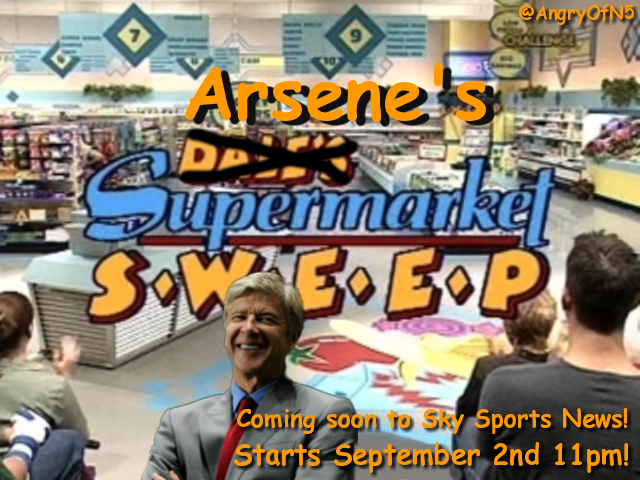 You have to admit that Arsene Wenger is a miserly old …. I tried to read your post but honestly I can’t say it gave me confidence in your ability to assess the performance of Arsenal tea ladies, let alone the manager…. For all those Wenger diehards, no matter what Wenger does this season, no more excuses ! NO MORE EXCUSES ! PERIOD. Nice and short with a sharp kick in the balls. More whining Bull from the BS master! Poor little moaners never getting what they want but always moaning and whining anyway, even if they did get something. Stick to what you do best, criticizing AFC and Wenger even though you haven’t a clue about anything that goes on at AFC and never will. Wankers all……Ziontrain is right…..you moaners wouldn’t know proper Football if it hit you in your collective ugly gobs. “Our talent” I think you mean the stars he developed himself. Or are you claiming you knew Van Persie was a star when he was a reckless 21yr old winger, or even when he was a decent but not world beating and mostly injured 2nd striker? I’m sick of it! I’m fed up! We lose a world class player like Luis Gustavo to protect the playing time of mediocre player like Aaron Ramsey! Ridiculous! Nothing could signal Wenger’s decline more than his decision not to guarantee Gustavo a starting place in order to protect Ramsey. I’ve supported Wenger in the face of many people calling for his sacking, but if he fails to either close the Suarez deal or bring in comparable world class talent to accompany Jack and Santi in the next two weeks, I’m done with him! Enough is enough! Sick of Arsenal being 4th place cowboys! World class player would not need a guarantee of a starting place….they would have confidence in their talent.Besides which you cant win anything if players not fighting for their places. You think Mourinho or Pellsgrino or Moyes or AVB are guaranteeing anybody places? ziontrain: Quite a contrast to your usual role of the world-weary cynic: a rather simplistic take on the mind-set of world class players and managers as a kind of justification of Wenger for not closing transfer deals. Well, for a start, he may yet sign both Luises. But what is for certain is that you have no special insight into what goes on in the mind of Wenger, the players or the managers you mention. What is disturbing (to most of us, I think) is that we play the opening game of the season with a squad which is depleted not strengthened, soon to followed by a voyage into dangerous Turkish waters. No doubt you will respond that AFC is Kroenke’s, to do with as he wants. Exactly as a serf might have responded in feudal times. Let’s see. Do you think Van Persie asked for a starting jersey guarantee before he agreed to go to Man U? Did Fabregas at Barcelona? You think Rooney has asked Mourinho for one? You think Suarez will get any such guarantee at Arsenal or Real Madrid? No. And that’s all you need to know about Gustavo, if he asked for a guarantee. Besides which it was a silly question as everyone knows that between injury, card suspensions and the volume of games anyone playing center midfield/defense at Arsenal will get games even if not a starter! Absolutely no need to get any guarantees. That to me would signal a player more interested in himself than team success. No surprise then that he is ditching Bayern (!!) and Guardiola too to go to Wolfsburg. Last I checked you are one of the many who said the likes of Andre Santos, Denilson, Chamakh and Gervinho and Coquelin were “useless”. Now that Wenger has sent them packing, suddenly you claim the team is “depleted”. Even though they didnt play at all, other than Coquelin, Gervinho and Arshavin’s cameos. Make up your mind please. If you sit down and look a the pattern of players that Arsenal has bid but lost out on for this summer and the past two transfer windows (Goetze, Capoue, Suarez, Gustavo) and the ones that never quite came to a bid (Higuan and Jovetic), its is clear that the club recognises a need for a striker and central midfielder. Also clear that they have specific players in mind who they think will fit best. Is that a crime, or just sensible action? Go look at Spurs that are already ditching Adebayor and Dempsey and ask yourself if it makes sense to just sign anyone available simply because you have a slot to fill. As for the ownership of AFC, are you another one of those armchair socialists? Someone else puts up the half billion pounds in cash and you get to spend their money for them. Laughable mate – even the proprietor of you local pub wouldn’t indulge you in that. Presumably that makes you a “serf” everytime you go in there for a pint. i just hope arsenal knows they are emotionally killing there fans with no new vital key players we obviously needed. Both of you have made pertinent points. Ziontrain is correct in his assertion that no manager would guarantee a player a starting place. That would be a case of the tail wagging the dog. Englandsbest is also correct when he suggests that the squad has not been strengthened. That may be stating the obvious but the obvious does not seem to be that apparent to the people who govern the club. The issue of under investment in the team did not start today or yesterday. It started a long time ago and while the manager is in the firing line at the moment the shift of emphasis from team investment to property investment did not necessarily start with him. However he stands indited of accommodating that shift and allowing others to influence player transfer and buying policy. Its all very well having a brand new Stadium, but as I have said before Arsenal is a football club and the team is at the core of its business. Don’t get me wrong, the Stadium is fantastic and a credit to those who had the vision. But both could have been done in tandem – Man U did it – . But c’est la vie. Our problems are in the here and now, missed opportunities, more rumours than a Fleetwood Mac album and still no signings. With respect to Arsene Wenger he does not appear to be a captain who is in total control of the ship he is steering. Unless things change radically very soon I fear the good ship Arsenal may flounder and leave the club out of its depth. literally.